Good:- Easy to understand.- Rich with ideas (for what one can get done with programming).- Probably will inspire some really young girls.- A good and accessible table of various languages and their uses.Bad: - Too simple.- For people who have seen any computer from very far.- Too many pics, too little info.- All the hype about girls not doing enough programming will probably backfire in our stereotype-laden society. It took a long time until coding came up in the book and to me there was to much text and not enough guided help. When I was at ALA, and I saw ARCs of this, I had to pick one up! I am very interested in coding and found this book to be super informative and inspiring! This is a great resource to get girls thinking about logic and computers and what they need to know in order to start building and programming. This is not a particularly good book. For a book that is intended for children - it is far too long and overwritten. I think this book is more likely to put people off coding than encourage them. It could do with less words, and more quizzes. I think the theme of appealing to girls is good - but I don't think the book does a very effective job of communicating the concepts. I listen to this on a playaway during a long drive And enjoyed it. I learn the difference between programming language in markup language as well as some other techniques to use with coding. Will definitely get this for the library and feel really inspired to try coding as well as maker space again. I've been thinking about how coding might sharpen reading and math skills. This may be a great introduction for middle school girls (and for this old girl), but it's not something that would appeal to the kids I work with. great book. inspiring and motivating. Super cool coding info and full of inspiration to excite our girls into understanding more about , and wanting to try, coding! A must read book for young women wanting to learn how to code and change the world. A librarian's choice all the way!!!! Solid introduction and overview for anyone who is new to coding, has an interest in learning to code and/or teaches coding to K-12 students. I liked the narrator for the audio...but there were so many pdfs that were talked about that I think this book needs to be read or be available when listening (so kids can see what they are talking about in the pdfs). But it was a great introduction to coding. And I liked how all the examples were things that kids (especially girls) would actually care about. I really liked the short interviews with various women already working in fields that use coding, and this is a quick but practical guide for anyone who's curious about how to get started. The audio is good, but read the print edition as you'll want to look at the diagrams and pictures mentioned. This was so interesting I nearly got a speeding ticket listening to it. 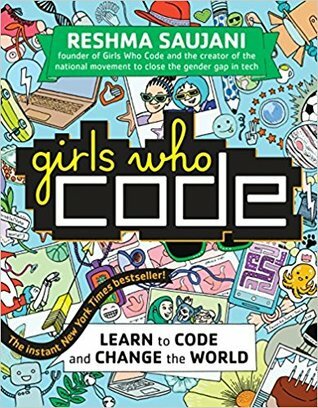 This book was recommended by a friend who knows the author and since my own girl is coding, I thought it might be interesting. It is written for middle school girls, trying to get them interested in STEM and computer science. I wish I had read it years ago, as I would have definitely tried to inspire one of my girls sooner! This book was perfect for inspiration as school is about to start back this week! I'm in love with coding and hearing all of these tips was incredible! This is perfect for girls who are interested in technology but scared to take the final step or even try it! Taking programming has been an honor in college. I'm ready to conquer the world with my fingertips and my computer! VERY easy to understand. This will definitely need to be on hand or nearby during club meetings. Great book for students to get a foundation for coding. Easy to read and understand!